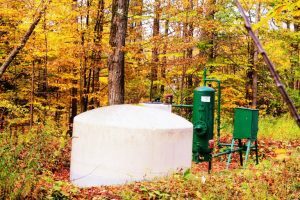 Raw natural gas contains non-homogeneous, solid and liquid contaminants, for example, water, mud and organic debris. While the removal of non-gaseous contaminants is necessary step in the raw natural gas conditioning process, separating solids and liquids from natural gas does not require particularly complex liquid process systems. But raw natural gas also subsumes gaseous-state contaminants, contaminants fixed in a gaseous state at temperatures above zero-degrees Celsius. Separating gaseous contaminants from raw natural gas requires far more advanced modular process systems. The two most prevalent gaseous-state raw natural gas contaminants are carbon dioxide (CO2) and hydrogen sulfide (H2S). Both are toxic to humans, and both corrode metals and alloys, which makes CO2 and H2S cost-prohibitive to store, as well as dangerous. Removing CO2 and H2S from raw natural gas is the most involved measure of natural gas process systems. Membrane elements and amines have proven to be the most effective and cost-efficient means of removing CO2 and H2S from raw natural gas. Membrane elements separate CO2 and H2S from raw natural gas in a manner analogous to the process by which water is drained from spaghetti through a strainer. Amine natural gas conditioning is a process by which an aqueous alkanolamine solution creates a chemical bond with CO2 and H2S. The result is a solid-state byproduct that is easily be separated from natural gas. Raw natural gas packaged process systems that use membrane elements — exclusively —are highly cost effective in relation to amines. Though the startup costs of a membrane element system is greater than that of an amine system, there are no supply costs, and it is only necessary to replace the membranes occasionally. Amines degrade relatively quickly, and amine conditioning towers must be resupplied periodically. Another cost-saving feature of membranes is that there is no byproduct waste. Amines degrade into amine salts, a waste product that has little to no value with respect to raw natural gas conditioning. Disposing of amine salts at an approved site is a factor that adds to the costs of an amine conditioning system, as does the labor and transportation required for disposal. Amine systems create far cleaner natural gas products. Amines can reduce the number of containment parts-per-million to a much lower level than membrane elements. Membrane elements, particularly as they age, leave a greater sum of CO2 and H2S in the finished natural gas product than does an amine chemical reaction system, which means there are certain industries that cannot use the semi-soiled natural gas. The startup costs of an amine natural gas conditioning system are also considerably lower. For companies trying to reduce initial costs, an amine system is ideal. While the long-term costs might be higher, getting started with amine gas process systems is less expensive. Membrane elements do not produce natural gas that is sufficiently clean for use in certain industries. Amine systems can be costly, particularly when containment levels are high. But by putting a membrane element upstream of an amine conditioning system, a supplier can produce highly conditioned natural gas and keep supply and waste costs to a minimum. Since the natural gas sent to the amine system is cleaner, amine supply costs are reduced. If a company has limited finances or low parts-per-million standards to meet, an amine system is best. For a company whose parts-per-million standards are stringent and who has an abundance of startup financing, a membrane system might be best. However, a hybrid system is both the most productive and cost-efficient. For more information on membrane separation techniques, and our gas and modular process systems, please visit us at Integrated Flow Solutions.